Huaraz is a city in central Peru. It has a population of approximately 100,000 and is the capital of the Ancash region. 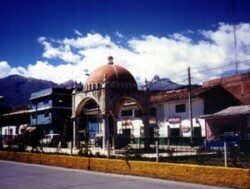 Huaraz is situated at an altitude of 3100 m in the Andes mountains, some 450 km north of Lima. Huaraz sits in the agriculturally important Callejon de Huaylas valley, at the foot of the Cordillera Blanca mountain range, which includes Huascaran, the highest mountain in Peru at 6768 m. Huascaran National Park is a popular destination for tourism and trekking peru tourist attractions, and Huaraz is a frequent base for expeditions to the Cordilleras Blanca and Huayhuash. Tourists often come from Argentina, Italy, Switzerland, Israel, Germany, the UK and the United States. Peru travel adventure is amazing and interesting because there are many unique places, mountains, beaches and etc. On 31 May 1970 the Ancash earthquake destroyed much of Huaraz, killing 10,000 people. Nearby Yungay was completely buried by material from Huascaran, with the loss of 30,000 lives. Vallanuraju is a glacier 5675 meter over sea level, from its summit is possible have a wonderful view of the other glacier of the Cordillera Blanca (white range).